ISTE Certification is a competency-based, vendor-neutral teacher certification based on the ISTE Standards for Educators. It recognizes educators who use edtech for learning in meaningful and transformative ways. Through the ISTE Certification process, teachers will participate in professional learning based on the ISTE Standards and transformative pedagogy. After completing the training, participants have six months to apply their learning and compile artifacts and reflections into a competency-based portfolio to earn ISTE Certification. View the sample syllabus or download the program brochure. Interested in bringing the ISTE Certification training to your school? Contact istecertification@iste.org. Step 1 - Complete a two-day face-to-face training conducted by an ISTE Certification Authorized Providers. Step 2 - Complete a five to eight week online course (approximately 30 hours). Learn more in this sample syllabus or download the program brochure. Step 3 - Assemble your e-portfolio of artifacts and submit them to the ISTE certification review panel. Aspiring ISTE Certified Educators will have six months to apply their learning and submit their e-portfolios. To earn ISTE Certification, you’ll need to participate in a two-day face-to-face training and an online component that can last 5-8 weeks depending on the provider. Plan to dedicate 4-6 hours per week during the online portion. After completion, candidates will have six months to present their evidence to ISTE Certification evaluators. Do you have the tech skills? Experience working in an LMS is necessary to be successful. It also helps if you’ve had a few online courses under your belt. The online component involves 30 hours of instruction, and it moves fast. Are you familiar with the ISTE Standards? A basic understanding of the ISTE Standards for Students and the ISTE Standards for Educators is a prerequisite for this course. ISTE Certification is designed to bring transformative change to your classroom or school. The program is not your average PD course. It’s intensive, ongoing training and requires documentation. Not ready for certification? Check out some of ISTE’s other resources and PD offerings to get start you toward certification. 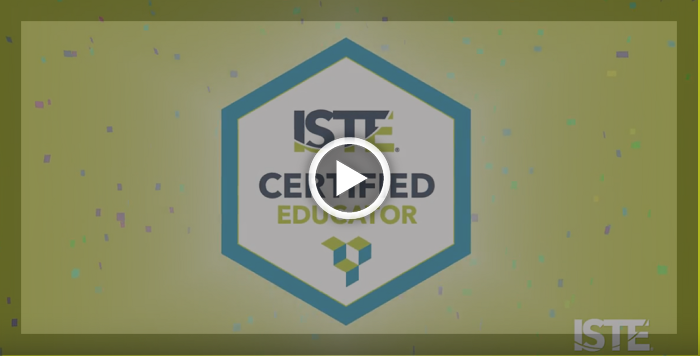 Stay informed about becoming an ISTE Certified Educator! We will pass your information on to your closest Certification provider.